Blessings, Miracles, &Thoughts in Between: 11 Months! I am almost a week late with this update. It's been a busy week filled with both good and bad news so Kate's monthly update was put on the back burner! Obviously, the good news was the news about Kate's match! The bad news came Wednesday (before we knew of her match) and was in regards to her biopsy results. Kate's bone marrow looks horrible and is no longer "healthy". It was "healthy" back in January meaning her condition is taking over quickly. I know God's timing of finding a donor was/ is perfect because Kate needs a transplant soon. Thankfully we do have a donor and continue to pray that the transplant occurs before Kate really starts to deteriorate. Kate turned 11 months old on Tuesday, the day after her bone marrow biopsy. She had a jammie day with Danielle (her nanny)! The only way I was going to get a picture was if she way holding and/or chewing on a bottle of tylenol. Oh well! Biggest Milestone: Kate is an exclusive walker now! She decided that crawling was for babies on her 11 month birthday and has been a walking machine ever since! I feel bad about this but the last month has been kind of a blur and I don't remember a lot of the smaller milestones. While I am thrilled about the new of Kate's match, I am now struggling to cope with the emotions I have regarding the next phase of this journey. Kate's hospitalization, chemo, and transplant were shoved to the back burner while we waited for a donor. They can't be pushed to the back anymore. I'm really nervous, scared, anxious about the coming weeks, months, years of out life. The severity of what Kate is about to go through is setting in and I am struggling. Ok, enough deep talk for now! I cannot believe that we are less than a month from the big one! This has definitely been the fastest, and best, year of our lives! P.S. - Please click this link and vote for us - clicking is all you have to do - super easy! Thanks! Beautiful! This year has been full of ups and downs for your family. Praying all goes smoothly for Kate and your donor from here on out! Thinking about you and hoping the transplant happens quickly. I'm hoping this all goes smoothly and you can one day put it all behind you. Much love. I came to your blog from Kelly's Korner and your story has really touched me. I have two babies - a two year old and a 3 month old. As a mother I immediately try to imagine how I'd be feeling in your place. I know you already found a match for your sweet baby, but I went ahead and signed up to see if I'd be a match for anyone. I figured it's the absolute least I could do. Your Kate is beautiful! 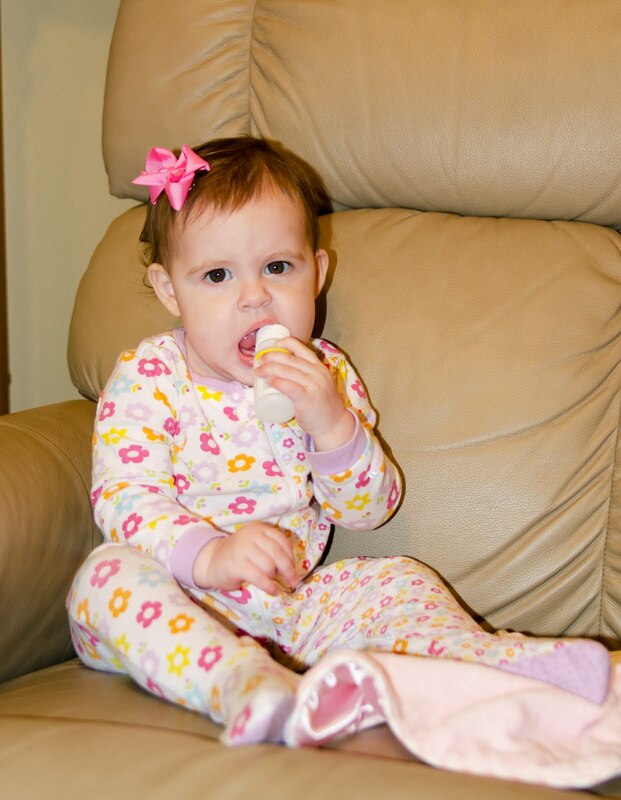 I have an 11 month old daughter as well- they sound very similar- loved the picture of her with the tylenol bottle! Tons of prayer and love your way! PS: I just got my husband to sign up too! Yay! I'm here from Kelly's Corner, too. We are all praying for your sweet little one. The power of prayer is strong. Hang in there! That sweet (and walking!) baby is continually in my prayers. I am SO SO glad y'all found a match!!! You know I am here for you! I wish I were physically closer to you, but we have to live with the distance. We pray for KK, you and Alex often and hope that you can feel the prayers. Remember that God is right beside you through this journey - He knows the trials and tribulations that you are going through and he is holding on tightly to you. Glad to hear about the donor! Definitely praying for your family. Over from Kelly's Korner. Your story/blog has touched my heart. I can only imagine as a mother myself how you must be feeling and I want you to know you have one more person praying for you!! That video of her walking is wonderful! She looks so proud of herself! I continue to pray for you guys as you take on this journey to Kate's recovery. Her story has touched so many hearts and there are so many people praying for your sweet girl, and for you and Alex. Thank the Lord for the match! I'll be praying for Kate and your family. Hugs! Thank the Lord for the match! That is awesome! I love the video, she is adorable! I'll be praying for Kate and your family. Hugs! Omg she's walking! And walking, and walking, and walking! What a big girl! The walking video is so adorable. What a cutie! Big prayers coming your way for the journey ahead. OMG, look at her walk! She is really good at it! You all are still in my thoughts! Happy 11 months to precious Kate! Look at her go! I love the way she is talking & so proud of herself the whole time she's walking! Sweet baby girl is still in my prayers!! 11 months. Wow. I remember when you were getting your nursery together. Doesn't seem like that was a year ago. I found your blog through a prayer request link on Kelly's Korner. I know what it is like to have a young child with medical problems. Mine spent 3 months in the NICU when she was born. I am praying for your sweet one tonight.